Normalized SKU: 0457DP4. Perko 0457DP4 Literature Download Owners Manual. Flush Pro Valve Kit - 5/8". Flush your boat engine safely and easily. Adapter supplied with Flush Pro make winterizing your boat easy. Overall height: 54". In addition, since the amount of light wasted outside of the visibility zone is greatly reduced, this light does not attract as many bugs. Reduced glare design focuses the beam of light above the operator's line of sight, which limits glare and improves overall night vision. Perko 0805007PLB Cast Bronze 1-1/4" Seacock Body Ball Valve Design. Pipe Size 1-1/4". Overall Hieght 4-1/4". Normalized SKU: 0456DP7. Perko 0456DP7 Literature Download Owners Manual. Flush Pro Valve - 1-1/4". Flush your boat engine safely and easily. Adapter supplied with Flush Pro make winterizing your boat easy. Normalized SKU: 0939DP1STS. Perko 0939DP1STS Literature Download Quick Reference Guide. PERKO VERTICAL MOUNT STERN LIGHT STAINLESS. In addition, since the amount of light wasted outside of the visibility zone is greatly reduced, this light does not attract as many bugs. Reduced glare design focuses the beam of light above the operator's line of sight, which limits glare and improves overall night vision. 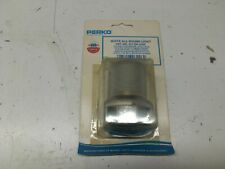 Perko Cat # 049300599D basket strainer stainless steel. Flush Pro Valve - 1". Flush your boat engine safely and easily. Adapter supplied with Flush Pro make winterizing your boat easy. Check valve automatically shuts off hull intake when water pressure is applied. #71 12 volt bulb included. Manufacturer PN: 1211DP2CHR. Stow-a-way plug-in type pole. Pole length 12-1/2”. Deck illuminating utility light. Propellers-Skeg Guard-Anodes. (below the price of the item). Bi-color bow light certified for replacement use only on power driven vessels under 12 motors (39.4ft.) Chrome plated zinc alloy with 3/4" Flag socket. No. 71 Bulb included. Base dimensions: 3 7/8" x 6 3/4. Heavy Duty Battery Disconnect Switch. w/ Alternator Field Disconnect. Heavy Duty Battery Switches. 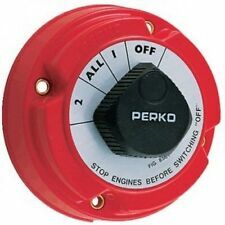 Up for sale is a new pair of Perko (red green) side lights part number 0963DPOCHR. 1 Mile visibility. red and green lenses, complete with 12 volt bulbs. Perko fold down, curved masthead, all-round combination light. Requires (2) fasteners that are spaced 1 3/8" apart. Don't see what you are looking for?. 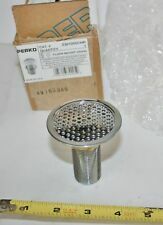 Up for sale is a new Perko bronze scoop strainer part number 0066DP1PLB. Cast bronze construction. Fits thru-hull sizes 3/8" and 1/2". Stainless Steel Side Navigation Lights. 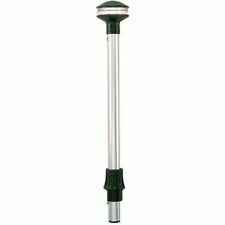 Certified for use on sail or power driven vessels under 12 meters (39.4ft) in length. Stainless Steel Top Black Plastic Base 12 Volt Base O.D. 2 3/8" Uses #8 Screws Sold as pairs, 1 Red, 1 Green . For 1 ½" fuel hose and 5/8" vent hose. Hinged flip top cap eliminates need for deck plate key and possibility of cap lost. One piece fill and bent assembly installs faster than 2 separate components. May be used on other boats. Part Number: 104137. Part Manufacturer: Perko. This removable bi-color lights are ideal for boats with casting decks on the bow. Unlike conventional bi-color lights that can stand as high as 2" above the deck, removable bi-color lights can be unplugged and stowed while fishing. PERKO PART# 0227DP0CHR. MANUFACTURED BY PERKO. Trending at $29.28eBay determines this price through a machine learned model of the product's sale prices within the last 90 days. It has PERKO cast into the top of the glass. I believe it will fit many different early models of stern lights that PERKO made. It is about 2 1/2" high x 2 1/2" wide and is about 2" OD at the screw in thread end. HINGED ROPE DECK PLATE. Accommodates rope up to 1" dia. Flange dia. Use #8 screws. For 1-1/2" pipe. Perko bronze 3/4" Seacock. Some corrosion and scaling on the inside but otherwise good. All the plugs and screws are free turning. Manufactured by Perko, part number 1316001CHR. May be used on other boats. Part Number: 1316001CHR. Part Manufacturer: Perko. We're your port for thousands of hard to find boat parts, original manufacturer's parts and marine surplus. Part Manufacturer: Perko. Materials: Plastic. Colors: Black. warehouse: T337D. PERKO 1310 BI-COLOR LIGHT. Perko Part# 1310DP. Fold down adjustable angle mounting base with plastic adapter for "V" or flat mounting surfaces complete with knob and end plug. Chrome plated zinc alloy and black plastic. It has PERKO cast into the top of the glass. It is new and still in its original box. It is about 2 3/4" high x 2 1/2" wide and is about 1 7/8" at the screw in thread end. These are so BEAUTIFUL LITE UP they could be used to create a nice nautical night light too.it is what I did with one for myself. Perko Part# 1445DP4 - Fits Perko style bases with 5\u00b0 angle. Normalized SKU: 0178DP1BLU. Perko 0178DP1BLU Literature Download Owners Manual. LED Surface Mount Trim Tab Underwater Light. Lab Rated LED Life: 50,000 Hrs. LED Beam: 15 degrees. 8 Feet of 18 AWG Marine Grade Electrical Cable. Mounting hardware and the catch are not included. (22 A / HD / 9021148). Fig. 0972DP0CHR. Perko Bi-Color Bow Light. 1 mile visibility. 12 volt DC bulb included.